To the right is a sneak peek at the cover to Ion #1. Click on the thumbnail for a larger image. Former Miss Universe Denise Quinones is guest-starring in "Vengeance," the Feb. 2 episode of Smallville on The WB. "Clark (Tom Welling) discovers the new reporter at the Daily Planet, a bespectacled, bumbling woman named Maya (Quinones), is actually a masked avenger who fights crime at night. Meanwhile, Clark's bottled-up grief threatens to get the best of him." Al Septien and Turi Meyer wrote the episode, which was directed by Jeannot Swarc. Quinones, 25, won the Miss Universe title in 2001. Her acting resume includes Bad Boys II and the television series Freddie. * Below are images from "Lockdown," this Thursday's new episode. Click on the thumbnails for larger and fuller images. * Below are more images from "Reckoning," the 100th episode set to air on Jan. 26. Click on the thumbnails for larger and fuller images. * Look for more Smallville news and interviews this week here in The Continuum. 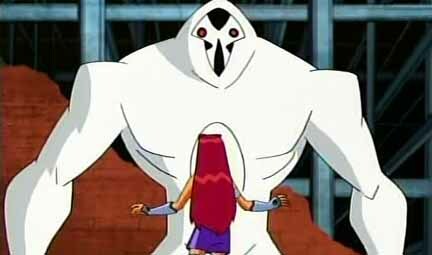 "Things Change," the season- and possibly series-ending episode of Teen Titans, will premiere on Monday at 4 p.m. on Cartoon Network. "After months of fighting the Brotherhood of Evil around the globe, the Teen Titans are finally back home. But a walk through the city reveals that things are no longer as they remembered. And while Beast Boy wants everything to be just like it was in the past, he has to face the fact that in life things change." "Things Change" was written by Amy Wolfram. The episode kicks off the network's Miguzi block in its new time period of 4-6 p.m.
Click on the thumbnails for larger images from "Things Change." 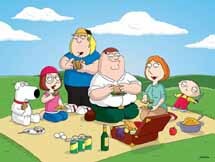 Counter-acting the Super Bowl on ABC, Fox has scheduled a marathon of The Simpsons and Family Guy episodes for Sunday, Feb. 5. 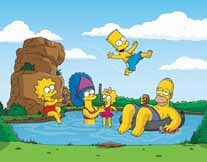 Episodes of The Simpsons include "Treehouse Of Horror XVI" at 7 p.m. (ET/PT); "Simpsons Christmas Stories" at 7:30 p.m. and "The Italian Bob" at 8 p.m.
Episodes of Family Guy include "Breaking Out is Hard to Do" at 8:30 p.m.; "Model Behavior" at 9 p.m.; and "The Perfect Castaway at 9:30 p.m.
New episodes of both shows are expected for the February sweeps. * To the right is a first look at art from Cyberforce #2, due in April from Image Comics. * Among the contributors to Tales from a Forgotten Planet #2 from Narwain are Andy Kuhn, Christopher E. Long, Shannon Eric Denton, Rob Worley, Moreno Burattini, Tom�s Mor�n, Luca Panciroli and Jesus Barony. * Coming Monday: DC Comics for April -- and much more!!! * Tuesday, Jan. 10 Dark Horse Comics for April, DC Comics First Looks, Justice League Unlimited, Moonstone Books for May and Green Lantern.